Good players are good because they think. That's what separates them from the poor player – who plays without thinking. But not all thoughts are helpful. Some hurt your poker game. Unfortunately, good players can also get themselves into trouble with their thoughts. They can cleverly justify playing when their best option is to stop playing. I'd like to list five of those thoughts tend to hurt rather than help. Thought #5: "He's probably bluffing". Players want to play. They look for excuses not to fold. So sometimes, even when you think you're probably beaten, this thought can creep into the back of your mind to convince you that there's at least some possibility that your opponent is bluffing and that you should continue with a marginal hand into a very strong bet. In limit poker, this isn't a problem. The instinct that propels you to call on the river is a usually a good one, since the pot is usually many times the size of the limited bet. However, in no limit poker, when the bet is often as large as the pot, this can be a serious problem. Of course there are times when your opponent is bluffing and a call is in order. But you must guard against the thought that your opponent may be bluffing to just serve as an excuse for you to call a bet when your better judgment tells you to fold. Thought #4: "I can't fold now". You're playing $1/2 no limit. You're in the 8 seat. You're dealt A9. Everyone folds to you. It's not really a raising hand, but from late position it's worth a stab. You make it $10 – happy to win the blinds or maybe get one caller and then hit an Ace or win it on a bet on the flop. The small blind folds but the big blind makes it $20, raising you $10. 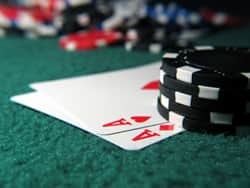 Your better judgment tells you to fold – there are just too many hands that can have you dominated: Any pair 9s or higher, or any Ace with a kicker larger than 9. But then your ego creeps in and this thought starts to form, "I can't fold now". You don't want to back down and so you call. The problem is that you allowed this thought to overwhelm your good sense. Of course you can fold. You made an attempt at a semi-bluff but then the target of your attack became the attacker. This indicates a hand that has you dominated. Don't allow "losing face" to keep you from making the right move. Sometimes in poker, especially in no limit poker, your best move is to back down. Thought #3: "I must bet". There are surely situations that call for aggression. It's not too far a reach to say that aggression is the key to winning no limit play. But aggression in the form of betting needs to be intentional, not automatic. You certainly know this. Yet sometimes, otherwise good players bet automatically – because they feel that they are expected to do so. Imagine you have a pair of threes in middle position. You call in a very loose and passive game. You're in luck and no one raises. Five players see the flop. It's a bunch of low cards. The three players in front of you check. You don't have anything. Even so, you have a reputation as an aggressive player. You don't want to look weak. You think that you must bet here in order to keep control of the table. And so you do. The button – a pretty loose player, calls you. The turn is an Ace. Again, you think that you must bet so your opponent doesn't think you're weak and try to run you off the hand. You bet again. Your loose opponent calls again. And on the river, hitting nothing, you figure you need to show strength in order to win and so you go all in – only to get called by an opponent with a weak Ace. The problem wasn't necessarily in what you did but why you did it. You didn't have to bet. You probably should have checked and folded to a bet – or seen a free card if your loose passive opponent checked behind you. But the thought that you needed to bet to show strength sabotaged your better judgment. Thought #2: "What's another few bucks – I'm already stuck a lot". This is a huge stack killer. A few bucks is the same amount of money no matter how much you are ahead or behind. If it's wrong to call or bet with it when you're dead even then it's wrong to do so if you're behind. Your status of being up or down should have no bearing on what your betting action is (with the exception of considering how it may affect your image in the mind of your opponent). Those "small" bets that you toss in when you're behind because they don't matter add up considerably over the course of a night – and certainly over the course of a career. If you are starting to think that losing a little more doesn't really matter, then it's time to walk away from the table. Thought #1: "I'll just stay until I'm back to even". This is the most punishing thought – and the one that is probably responsible for the most ill effects on our stacks. If we're behind, there's probably a reason. Maybe it's just part of the natural ebb and flow of poker. But it's more likely that we're not playing well. If we're thinking about leaving when we get back to even then we've probably been playing for a while. Otherwise we wouldn't even be considering our exit strategy. Put those things together – the chance that we are not playing well and the likelihood that we have stayed for a while and may well be tired – and you have exactly the wrong circumstances for playing our best. It's far more likely that if we are thinking of leaving and we're stuck that we will get more stuck before we go. The more tired we get the worse we play, the further behind we get, the more desperate our need to stay and get even becomes, and the worse we play. The only sure exit then becomes when we lose our playing bankroll or, worse, go broke entirely – emptying our safety deposit box, withdraw funds from our ATM, and max out our credit cards. That's a death spiral.